Rex Tillerson, Trump's Possible Secretary Of State, Is A Welcome Face In Moscow : Parallels "The choice of Tillerson is sensational. Trump continues to amaze," a Russian senator tweeted. The Kremlin was more circumspect, but it's clear the ExxonMobil chief has high-level fans. Vladimir Putin, then Russia's prime minister, toasts with ExxonMobil's Rex Tillerson (left foreground) and Igor Sechin (right foreground) outside Moscow in April 2012. Sechin, a close Putin ally, was then deputy prime minister and now serves as CEO of Russian oil giant Rosneft. A few years ago, when ExxonMobil chief executive Rex Tillerson hobnobbed with Russian President Vladimir Putin, they didn't draw much attention. But photos of those meetings re-emerged over the weekend, as multiple media reports named the Texas oilman as the favorite to become Donald Trump's secretary of state. Tillerson's ties to the Kremlin gained added piquancy as the CIA concluded that Russia had intervened in the U.S. election to give Trump an edge — an assessment the president-elect called "ridiculous." What's undeniable is that the 40-year ExxonMobil veteran, who has some two decades of experience in dealing with Russia, would be a welcome face in Moscow. 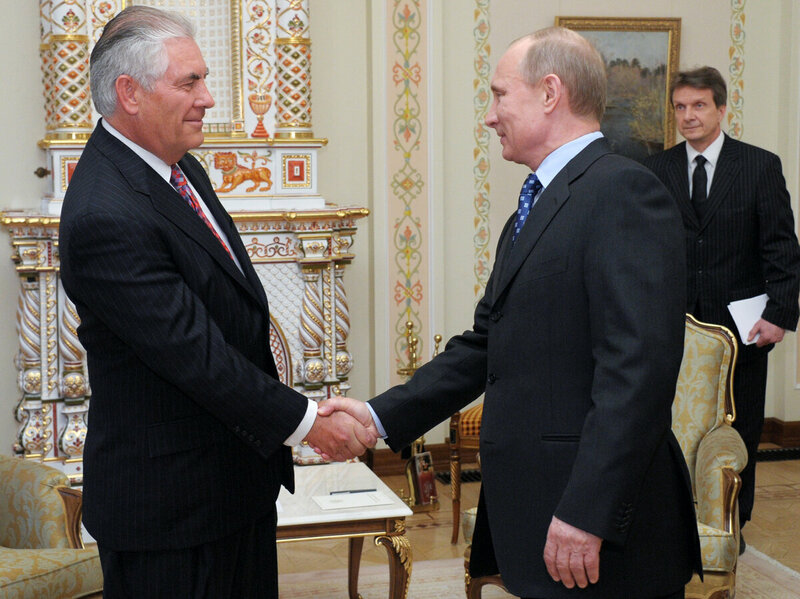 Vladimir Putin shakes hands with Rex Tillerson, chairman and chief executive officer of ExxonMobil Corp., at a meeting in April 2012, when Exxon teamed up with Russian oil giant Rosneft. "The choice of Tillerson is sensational. Trump continues to amaze," Russian senator Alexei Pushkov tweeted on Saturday night. "This choice confirms the seriousness of Trump's intentions." The Kremlin was a little more circumspect. There's a big difference between being secretary of state and heading up a major company, Putin's spokesman Dmitry Peskov told journalists on Monday. More important than sympathy toward Russia, he said, is "a constructive attitude and professionalism." Tillerson proved those two qualities to Putin when he oversaw ExxonMobil's 2011 strategic alliance with Russia's state-run Rosneft. While some of the world's biggest oil majors — BP, Shell, Total — saw their Russian projects frustrated, ExxonMobil came out on top as the Kremlin's unlikely partner of choice. The only thing stopping that relationship from developing were U.S. sanctions against Russia following its annexation of Crimea in 2014. Rosneft president Igor Sechin, a close Putin associate, was barred from traveling to the U.S.
"The Russians respect strength, and they see it in ExxonMobil and Rex Tillerson. 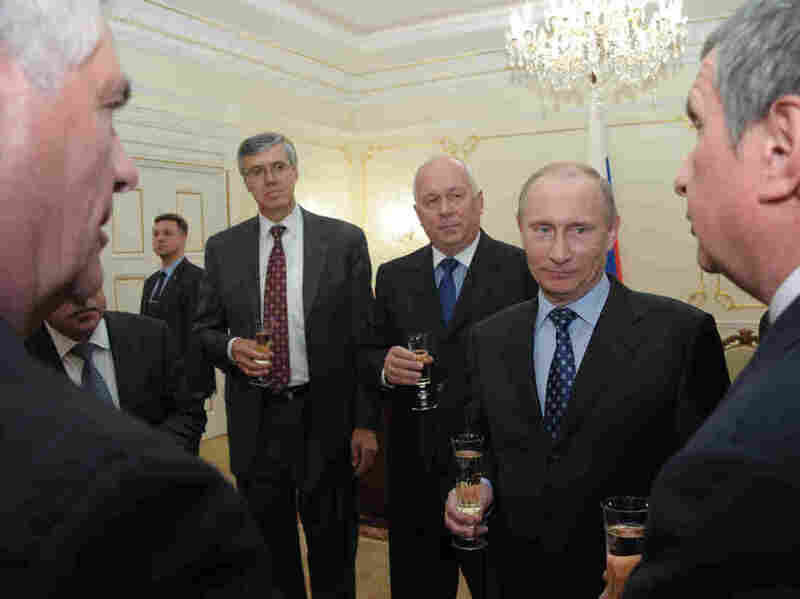 They like him," Edward Verona, a former ExxonMobil Russia vice president, told NPR. "Putin likes that personality type — not exactly the Trump personality, but the personality that quietly projects power, discipline, control." Tillerson's rise to the top of ExxonMobil came after he brought Sakhalin-1, an offshore development in Russia's remote Far East, online. In a 2005 interview with a Russian newspaper, Tillerson attributed the project's success to ExxonMobil's straightforward dealings with the Russian authorities. Ten years ago, when Shell lost control of the nearby Sakhalin-2 project to Russia's Gazprom, Tillerson warded off pressure from the state-run gas company by building bridges to its rival, Rosneft. "Rex found an ally in Rosneft in taking on the 800-pound gorilla, Gazprom," said Verona. "It's a pretty good example of diplomacy, alliance-building, seeing who your friends are and what they can do for you. It was pretty shrewd deal-making." At the same time, even Gazprom executives were impressed by the way Tillerson fought back attempts by President Hugo Chavez to seize ExxonMobil assets in Venezuela, Verona said. ExxonMobil was not the most obvious choice to work with the Kremlin, not least because it is an American company. But after Sakhalin-1 brought Russia new technology and revenue under a so-called production-sharing agreement that went into effect in 1996, the thinking in the Kremlin gradually changed. Key to the relationship with Rosneft was getting its president, Sechin, on board. Sechin, a former KGB agent like Putin, oversaw Rosneft's transformation from a middling oil company into Russia's biggest crude producer, mainly by swallowing up its rivals. "Sechin greatly admires and respects ExxonMobil. It's what he wants Rosneft to be," said Verona. "When he meets the quintessential Texan oil guy, he's captivated by him." Tillerson sealed the deal not only by offering to help develop Russia's challenging Arctic oil fields, but also by treating Rosneft as an equal with an interest in ExxonMobil projects in the U.S. and third countries. That cooperation is now on hold because of sanctions, which Trump said during the election campaign he would consider lifting. ExxonMobil and Rosneft would be among the biggest beneficiaries, should that happen. If Trump nominates the Texan for secretary of state, Tillerson will still need to be confirmed by the Senate. Tillerson's biggest challenge may yet be convincing the Senate that he can distinguish ExxonMobil's interests from those of the United States.